Quick Response Code, commonly known as a QR code consists of black and white modules arranged in a square grid. QR codes are becoming increasingly popular among companies in areas of marketing. There are many apps out there on Play Store which can be used to scan/read QR codes. Here are the top 5 QR Code Readers for Android Mobile Phone, iPhone, iPad, Windows Phone and tablet which are currently on Play Store available for free download. The qr code reader app which is going to hit up this list is ‘QR Code Reader’. This app is available on both Android phone and tablet. This app is very simple to use and very much user-friendly. All you do is fire up the app from your device, point the app’s camera at the QR Code and bingo! The app automatically scans the QR Code in 6 seconds (or even less!). If all the QR Code has to offer is nothing more than plain text, the text is displayed on the screen. Reviews say the app is quick and some reviews also say it scans blurry codes. The app is rated 4 stars on Play Store and is free to download. 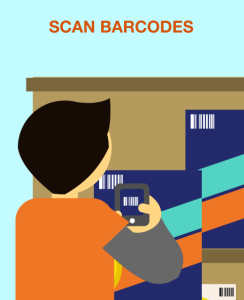 The best QR Barcode Scanner app decodes text, URLs, ISBNs, mail, contact information and much more. All it requires is a single click on the QR code using your smartphone’s camera. If the code contains a URL, the app automatically redirects you to the website. If the app contains text, the text is displayed on the screen. It also is enriched with a QR Code generator feature. This app is available for free download for Android devices. The app is rated 4.3 stars. The QR Code Scan and Barcode Scanner app for android work very similar to the apps listed above. All you have to do this, fire up the app, point it at the QR Code and the app decodes it for you. It is rated 4.3 stars and is free to download on Android devices. A simple tool used to scan and encode QR Codes. It claims to stand out from the rest of the lot because of its features, like the ability to scan Data Matrix codes and Barcodes. The app is rated 4.2 on the Play Store and is free to download. The last app to be hitting up this list is QR Droid Code Scanner. Just like any other QR Code scanning app, it scans QR Codes. But this app is also loaded with a lot more features. This app can be used to create a QR Code from a contact or bookmark. This app is rated 4.2 on Play Store and is free to download. That concludes the list of the top five QR Code Scanners available on the Play store. Please do note that all the apps mentioned above are free to download.